I’ve been thinking about the way you see colours that go with each number, and also colours for each day of the week. It’s called synaesthesia- but you probably know that- and you seem like the have number-colour synaesthesia (which is common). There are other kinds like sound-colour synaesthesia or even sound-taste synaesthesia (people who get a taste whenever they hear certain sounds!). Anyway we were talking about it at Burning Man, maybe, or at Christmas, and I seemed to be able to guess the same associations between numbers and colours as you actually see, even though I know I’m definitely not synaesthetic (did you know that synaesthesia is much more common in women than men?). So I thought what I was probably doing was remembering a synaesthetic association from childhood (did you know that synaesthesia is far more common in children? ), and that was how I was getting a colour for each number- from memory . So, next thought, is there a way to distinguish between someone who just has a memory of an association- or is just imaging an association- from someone who really is seeing actual colours when they are shown numbers? Is there, in other words, a test we can do to check if you are really synaesthetic? And of course there is, so I thought I’d write to you and tell you about it and you can have a go. We’ll get to the test in a sec, but first here’s how it works. It works because colours are obvious. They jump out at you, they’re a kind of visual building block (there’s an early part of the visual system devoted to colours, and neural specialisation is always a good indicator of importance). So, say if you look at a collection of black things and some of them are red you don’t need to search – the red things just jump out at you. Something we (I mean psychologists) sometimes call ‘pop-out’ (technical, eh?). You can demonstrate this to yourself like this. Your job will be to look at a collection of black symbols, and spot the red coloured ones. Click on this link to open the image in a new window. What you should find is that you don’t have to look at them one by one (“what colour is that one? black. Move on. What colour is that on? black. Move on” etc etc), insteaad you just instantly spot the ones which are coloured red. They pop-out at you. No effort required, the answer is just delivered direct to your conscious awareness. So here’s the test of synaesthesia (well, it’s a test of number-colour synaesthesia at least, which is one kind you have. Do you have any others?). If numbers really do create an actual experience of colour for you, then different numbers should pop out at you in the same way that different colours should. The trick is to control for the different shapes that numbers normally have. So what some very clever people did  was use two numbers that have the same shape, 5 and 2, but are each the reverse of each other upsidedown. Anyway, yes, the test. 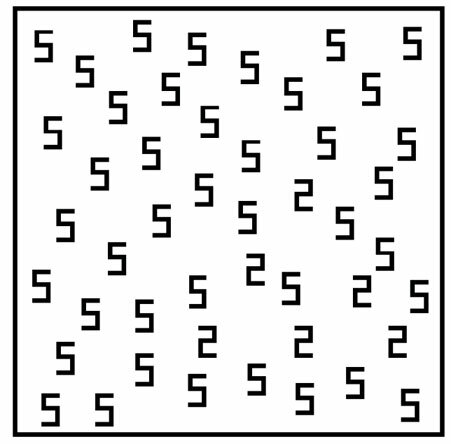 Your job is similar to last time: look at the image here and try and spot the numbers which are different from all the others. If you can do it as automatically and easily as with the first image then you are really synaesthetic and when you see numbers you really do get an honest-to-goodness perceptual experience of colour. If you can’t, well then it’s not a perceptual phenomenon, but more of a memory and imagination phenomenon (which doesn’t make it not real, it just makes it less unusual). So this is one way you can confirm to yourself, or test someone else to see if they are properly synaesthetic. Another way is to put them in a brain scanner, and you can see that, for example, numbers really do activate the visual cortex . i have synesthesia too, its awesome! i love it. i think of it as a different look on life. Youe link for the 2nd image (the one of 5’s and 2’s) should go to popout2.html. It currently goes to popout1.html. I’m kind of confused. It doesn’t happen with the week days, or with other things, I only experience it when I look at numbers. Does that mean I have it, a small bit of it, or was it like you said, the memory one. I always get a bitter taste in my mouth, when a notes played wrong, because I play piano, clarinet and violin. I just really want to know. I’m fascinated in this stuff too. I love to research about the human mind, although I think mine is a little screwed up. I don’t see things like other people, no, I don’t need glasses. I mean I just kind of see things differently. When someone asks me to picture an apple in my mind, I can’t actually make a picture. I can think of what I know one looks like, yellowish, with splotches of red on it, and a bruise, but I can’t actually see the picture in my mind. Another time they asked me I thought of a book, because it had an apple on the cover, but I thought of the book first. What does that mean, what’s wrong with me! Oh, do you know anything about knowing how people feel. Like say someone had lost a loved one, and they were hurt. You know they’d feel so sad. I’ve lost someone deer, but not anyone extremely close. The weird thing is, I can imagine how much they’re going through. I can feel what they’re feeling. I feel it, as though it happened to me. Sometimes when I feel it, I start to cry, even though nothings happened to me. Is that normal? For me, it’s like walking down a hallway and feeling everyone’s pain, happiness, love, care, friendship, and hate. I can literally feel it, and it bothers me. It’s almost like knowing what they’re thinking, except not in words. I could look at a person, and tell what they’re thinking right away. Although, I tried to avoid as much eye contact as possible, and for some reason, I don’t know why; I end up looking at their mouths. Is that abnormal? I mean I could look any where else, but I choose to look at there mouths. So I have this thing where sounds make me feel touch. When people write with mechanical pencils near me I get the sensation of sandpaper on my fingertips often to the point where I cannot touch anything. The sound of styrofoam makes me ultra sensitive to touch and I even sometimes get cold. There are many other sounds that trigger senses. is this synaethesia or am I just crazy? I just wanted to say, you almost just perfectly described what happens to me regularely. I have no idea if this is synthesia or not, but I wish someone would tell me. Hey everyone! Check this: http://www.tukan.extra.hu !! 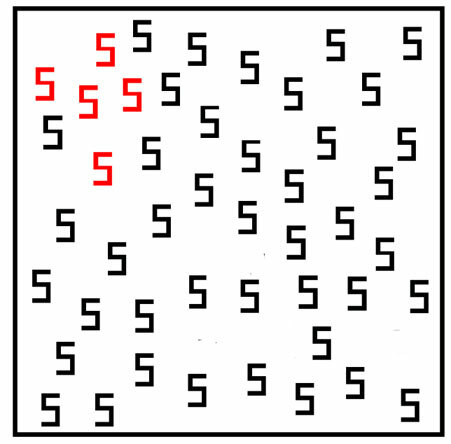 There is a great synesthesia test – you can vote for the color of each letter and number and see statistics. really interesting. In one of the articles I‚Äôve read, someone mentioned something about ‚ÄúA steady development‚Äù in the numbers of people with synesthesia. So it got me thinking, ‚ÄúWhat if all people have it? What if all people have it, but they have different levels of intensity of it?‚Äù I sometimes have the odd sensation of seeing certain images when I hear certain music. (Though these probably don‚Äôt have anything to do with synesthesia) But isn‚Äôt synesthesia the brain working to make connections with senses, details, and other such things? I‚Äôm sorry if I seem ignorant of this topic, but all of those articles meant for scholars and scientists are really confusing for me! I just need to somehow plan this test, and really, this experiment thoroughly. I‚Äôm not sure if anyone I know can help me, and I didn‚Äôt know if you could give advice, a personal account for ‚Äúresearch‚Äù, or something of that nature. Please contact me soon!!!!! Hey together, you also can test your synaesthesia with the new synaesthesia-tests available on http://www.synaesthesia.com. There are also some new features like the “out-in-space-test” where you can draw you year and your week. Recommend this test to your family and your friends. There are also workshops and informations. Have a look on it. We’ve recently been working on a website to allow for the testing of mirror touch synaesthesia. This is where the viewer feels a strong sensation when seeing another person, usually, touched. There seems to be a link to the level of empathy the person feels. You are invited to take the test. It consists of about 96 very short video clips and an empathy questionnaire at the end. Inevitably there are a few questions about yourself but the study is completely anonymous. If you want some followup then please email Naomi Hillman using the email address given on the last page of the study. Thanks for this, Tom. You packed a lot of valuable information on synesthesia in this short entry. I find the correlation between synethesia and creativity particularly interesting. Daniel Siegel, in The Mindful Brain, associates creativity with what he terms “right mode perception” (wherein right hemispheric processes play a key [but not sole] role in perception), which he attributes to the parallel processing power of the right hemisphere (in a right-handed person), facilitated by cross-modal (i.e., interlobe) wiring otherwise lacking in the left hemisphere. Such parallel wiring could, as I understand it, mediate the kind of ‘multi-dimensional’ perception as evidenced in synesthesia. The reason I use the term ‘multi-dimensional’ and not ‘multi-sensory’ is because, as you noted, such abstract symbols as number can be experienced as colors. Technically speaking, number is not necessarily a sensory modality, as it involves often purely mental symbolism (e.g., the square root of 252 is a purely mental, and not sensory, perception of the world); unless, of course, you include the mind as a sixth sense, as do the Buddhists. … I’m not synthetic, but I got saw the twos immediately. Am I synthaetic and just not know it? In a Jamie Ward video, he says that people who see the colored numbers in their minds eye instead of on the page (like me) would have an equal amount of trouble as a non-synesthete on that test. I only see colors for numbers with fives in them (red), but I see colors for alphabet letters and days of the week. I also taste some words. I used to be able to taste more when I was younger, and I still remember those words, but the tastes are mostly just from memory. Some still evoke an actual taste, though. For instance the word “church” tastes something like coffee cake and the word “speech” tastes like I’m eating an orange. So, I have seen colors with numbers, some words, and letters ever since around 3rd grade. I ignored it because i thought it was normal for everyone. But i guess ignoring it ws wrong because I had just found out it was a syndrome after reading a book called “A Mango-Shape Space”. Im 12 and just finding out about this. I’ve not told anyone except my mom. Im not sure if i’m syesthetic. I need to figure this out. You are definently a synesthetic! I have always wanted to read that book but i don’t know where to find it. I hope this helps you understand!! I loved the book “A Mango Shaped Space”! I read that in one day because it was so good. Best book ever. I personally don’t have Synaesthesia, but it is so interesting to learn about. If you have Sinaesthesia, what color is the name Lizzy and Elizabeth? I am so excited to find that I am not the only one who sees things this way. I have never told anyone of this until today. I correlate numbers, days of the week, and months with a specific gender. I don’t actively think about it- they just simply appear that way. I also perceive the callendar mapped quite differently than any I have seen. Lizzy is clear blue, like blue glass, and Elizabeth feels like silk and looks like fire. I am an artist who has been keeping a sound diary reccording everything I hear in the shapes and colours I see. Numbers are specific colours and tones are always specific in colour also.Colours move in different ways and in different shapes. Piano tones are always green and triangles yellow. Its funny because you can make connections with how you see colour in numbers because the number four is always yellow and the number seven which is similar in shape is yellow with green edges. It is definately genetic and my daughter is autistic. There’s a definate link. I’m a young synesthete who has grapheme-colour, music-colour, music-motion, and a bunch of others. I know I have synesthesia. But the thing is, your test with the 2s and 5s? It doesn’t actually work. In “Wednesday is Indigo Blue”, Dr. Cytowic says that it doesn’t work because for a synesthete to see the colours, they have to be “attended to”; that is, they need to see the 2s or whatever and recognize that they are 2s before they see colours for them. We have to see that they are 2s, just like normal people. So while synesthetes *might* be a little faster than normal people, take it from a synesthete: the test doesn’t really work. Numbers dont have colours for me, but I see colours on people.- Or at least I sense them. Some people are really green and others are orange. I can also see white energy surrounding letters, numbers, and people when I look at them. And certain smells have colours too. I dont know if what I have has anything to do with synesthesia. Is there anyone that can tell me what this is? My synesthesia is connected to colors and sounds. I have perfect pitch because each key reminds me of a different color so if someone plays a key wrong in my mind the color is off. Also i noticed loud notices trigger it. I heard a book fall off a desk, and i felt like i had the sensation of myself actually being hit by it in the back of the head and it was like the color red was all throughout my mind, and a loud pitch screech it makes me itchy and see the color yellow. Amy, That is exactly how I have synesthesia! If the color is off, I go CRAZY!! It is hard because I am in piano lessons and my mom playes the violin and if i or her plays a wrong note i can not stand it!! Also, Mellisa YES you do have synesthesia! It is almost in the same cadigory as tasting colors. I have never heard of energy surronding people, numbers, or letters but i am pretty sure that is a type of synesthesia. 🙂 I did a science fair poject on synestheisa and it worked really well! By the way Amy, I almost have perfect pich because of colors too!! THAT IS SO COOL!! I am only 12 but I know a lot about synesthesia so if you need any questions for anyone, feel free to post or reply to my comment!!! hi i think i might have synesthesia. the sound of cars on a highway let me see thine strait lines of red with yellow. my brother yelling a washing purple spot. i also see millions of tiny dots all over they flash white and black but this never stops even when i close my eyes. but i have great vision and can see even though they are always there. if someone has something similar please respond. Lulu, You do have synesthesia and I was watching “Ingenous Minds” on the science channel and there was a guy who had the same thing as you. He saw black and white squares moving left to right and he still saw them with his eyes closed. Also, he hit his head when he was young and had never touched the piano before but after he recovered, he had an urge to sit at the piano, and he played Betoveen like it was nothing. It was not simple Betoveen but it was elaborate pieces. I don’t know what caused this but it was crazy! You are not alone!! If you have any qwestions, reply or comment. Hello I am a synesthete – I didn’t know it until someone told me that I could be, about ten years ago, during a conversation about words. Id never heard of it before but looked into it and did some tests. Every letter and every number has a colour and texture – every word is a food – every month of the year is a fruit for me with distinct colour and texture. Certain words in the English language trigger a physical response, usually unpleasant – but some words I want to eat, such as the word ‘unusual’ which is plum tomatoes from a can. Many words I repeat over and over in my head as it’s the closest I can get to eating them. If Im on my own, I might even say them out loud! I have always had this and never thought about it until the conversation – if I had thouight about it I would’ve assumed everyone saw letters, numbers etc the same! Also musical sounds have shapes and textures for me as well. Im not sure if this is synesthesia or not but that’s how it is for me anyway. Hello! I am a synesthete myself, Generally I have the same type of synesthesia as you! Although we most likely don’t think the same, for example the month July reminds me of a ball of yarn.. And the word exclamation is like watermelon x) I recommend reading A Mango Shaped Space by Wendy Mass. In the authors notes it also gives some links to reccomended websites for synesthetes. Although the character in the book has a different type of synesthesia than me. Oh and names have a picture for me, For example my name ‘Sophie’ is like A sunset, and your name Catherine is like a ripe strawberry. Thanks for reading this. I have the name thing too! Is this considered to be a form of synaesthesia? I have synaesthesia, and sometimes it is extremely annoying but other wise it is ok. I think I have mild synesthesia ( I won’t say that I “suffer” from it) – I have it with words, people, names and sounds, but not numbers or timemarkers. It’s always interesting to read up on people’s experiances; I find it insightful, and it gives you another views to the world. Apparently, as the alphabet goes on, it gets darker! Yeah, that’s what happens to the notes on a piano. As the notes get higher, they become lighter versions of themselves and as the notes get lower they become darker versions of themselves. I recently discovered that I’m a sound-visual synsethete. I always thought that the colors and shapes I see when I hear sounds were just normal, and everyone saw them. It was quite a shock to hear my science teacher start talking about it, and describing basically how I see the world. I’m doing lots of reading now, and I’m suprised by all the different types of synethesia that are out there. It must be so cool to connect colors with numbers, and all the different things people do. When people talk I see the words in the air around them.. Music I see colors and see music notes. I don’t have synaesthesia but I am really weird in a way, I taste colors. I don’t understand it! Yellow makes me taste eggs, blue makes me taste steak! But the confusion of this is that my brain has been said “didn’t have synaesthesia”! Do you understand? You do have synaesthesia Will. It usually is not tested because it is so uncommon. Have you people not figured out yet that the things we see are spiritual realities and not neurological conditions? Same with those who use drugs to do so. why? Drug abuse is very much akin to witchcraft – potions – that change the spiritual perceptions of the user. There is an opinion in Judaism that Moses was only able to “see” G-d because of synaethesia-like circumstances. Moses heard His Words and “saw” the Speaker. Language is considered very holy – what G-d created He “spoke” into existence – and commanded parts of this “dialogue” to be recorded. Kaballah. I’m pretty sure I have a mild form of synaesthesia – my strongest forms are associations of colours to numbers, and a weaker form is when i hear music i see colours and stuff. I also used it to do my times table! My mom says that once i said to her that i remembered what 9 times 6 is 54 because purple times light brown is dark blue, dark green, and yellow, and she got really worried because she had never heard of synesthesia before. lol. Synesthesia seems really cool. Damn! I wish I had it. Sadly I am not synesthetic but I read somewhere that everyone has a little bit of it. I guess at times I have smelled something and described it as a color, when i was 9. I have always thought of the number 4 as green, 5 as blue, and 6 as red. I felt like my life felt that color (eg. when i was in grade 4 i felt green, in grade 5 i felt blue, and in grade 6 i felt red.) Well im not really synesthetic and i might be imagining it. Can anyone tell me if there as any way to “learn” synesthesia or get it other than drugs or getting into an accident >.> i’d rather not go through the pain. i have synaesthesia but is it normal to get feelings when you hear words like thursday feels like dark under a rock and sunday feels like a dragon asleep in a cave? I think that is another type of synesthesia. Do you mean that you see the picture of being under a dark rock, or you sense that that is what Thursday is? (Did that sentence make sense at all??!) In A Mango Shaped Space, some synesthetes had word-pictures for words. I think this is what you have. I don’t know if I’m synaesthetic or not. Every person is associated with a color. But time me it’s very logical. I even have a color. I’m a green. Most people’s colors go with their favorite color. And I also get those millions if black and white dots all the time. 24/7 almost like static on a tv. But I have 20/20 vision. I also ‘feel’ music. Like if a note or something is messed up or someone mixes 2 songs incorrectly and doesn’t best match, it becomes very painful for me to the point I even express it on my face. I don’t know. I still think most people see stuff that way. There’s other stuff but I wanna keep thinking it’s normal. Lol. Me too! Sometimes if i find myself tapping my fingers, i have to stop and do the same amount of tapping with my other hand, and if i don’t i feel really nauseous. This is weird! I have never given my synaesthesia any thought until now..and I certainly didn’t know everyone didn’t associate words with certain colors the way I do. Thursday = dark green. Wednesday = light blue. Monday = red. Tuesday = light green. Sunday = yellow. Saturday = dark red. Friday = dark yellow. I tried to picture the words with other colors and it does not seem right to me. So do I! Only for me Monday is bright yellow, Tuesday is dark blue, Wednesday is dark swampy green, Thursday is orange, Friday is rust-red, Saturday is dark red-brown, Sunday is light green. Sometimes, if it rains on Thursdays, the letters get all out of place in my mind. Hi, I’m a grapheme and ordinal linguistic synesthete. Also, most words have textures and feelings with them–like if someone says my name, Madeleine, i immediately feel like i’m touching cold black metal. Does anyone else experience anything like this?